JMF Disco offers an experienced Wedding DJ in Herne Bay to help with your special day. JMF Disco is owned and presented by DJ John Padmore, a reliable, experienced Wedding DJ in Herne Bay. My aim is to provide you with all the help you need, from your initial phone call to seeing your happy guests leaving after a wonderful nights entertainment, at your perfect reception provided by your Wedding DJ Herne Bay. Call or email JMF Disco for your Wedding DJ Herne Bay to find out how I can help you. Have a look at the Weddings page for more details of the Wedding DJ Herne Bay service I offer and call me to discuss how I can help make your evening very special. your booking confirmed in writing for your peace of mind - and ours! a fully insured, experienced, reliable and prompt mobile DJs using safety checked equipment - do not book a disco without Public Liability Insurance or PAT Certificated equipment as your venue might not let them set up without it! a great looking mobile disco set up with disco lighting to suit the size of the venue - not something with wires everywhere that looks like an explosion in a spaghetti factory that some DJs provide! your choice of music - let us know in your Wedding Reception Planner Pack what tunes you want to hear and we will play them - and just as importantly let us know the songs you hate and we will definitely not play them! a great fun party so that you can dance the night away with your family and friends to all your favourite songs. peace of mind knowing that your special evenings entetainment is in expert hands, allow you to be the best host ever! JMF Disco's wedding disco hire Herne Bay service will provide you with the entertainment you want for your dream celebration at any venue in Herne Bay and the surrounding areas - why settle for anything less? Contact Wedding DJ Herne Bay on Tel 01795 429777, Mobile 07895 546183 or by email to discuss your Wedding DJ needs or questions. 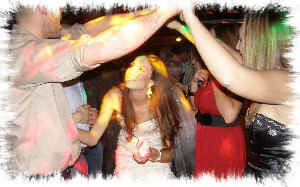 We provide great wedding disco and DJ services throughout the Canterbury area.